Dash cams are the number one way to provide hard evidence in the event of an auto accident, as well as the best way to capture unique footage while on the road. While you could easily mount a GoPro to your dashboard, these specially designed cameras come with unique functions that make them more suited to the task at hand. In 2018, dash cams are no longer a new concept. The market has flooded with hundreds if not thousands of models to choose from. As with all electronics, some are high-quality while others are cheap plastic with even cheaper components inside. So, how can you tell which models would best suit your needs? This article highlights the best dash cams on the market in 2018, using rigorous standards to weed out the countless sub-par options on the market. Here are our top picks. Before diving into our list, we feel that it is essential to explain how we created it. We don’t want to create another sales-pitch article or promote a particular brand: there’s enough of that content out there already. Our goal is to bring you an honest, accurate review. To do that, we take several aspects into consideration. First and foremost, we look at customer reviews and testimonials. Company claims and product information are helpful, but the real test of any product is in the user experience. Next, we take data surrounding the product into consideration. For our list of best dash cams, their features and functionality are essential. Extra features also played a factor based on their usefulness. Finally, we factor brand reputation into our decision. Some brands stand the test of time by providing top-quality products and exceptional customer service. So, trusted brands with an excellent product on the market gain a slight boost in our ratings. Out of all the choices on the market, we found these ten to be the best dash cams. Our list is ordered from five out of five stars first, working downward from there. The BlackVue offers both a front and back camera that record in 1080p full HD (720p for the rear camera). Parking surveillance is capable via the OBD II port converter, which plugs into your vehicle’s diagnostics port, and incident detection technology automatically flags what video footage should be saved. One of the more impressive features of the BlackVue is its Over-the-Cloud capabilities. At any point in time, you can view live footage from any smart device, laptop, or PC. That includes when your vehicle is parked. There’s no screen on this model. Instead, your smartphone becomes a viewing pane and remote to adjust the settings. Other features include GPS tracking, a 129-degree viewing angle, and a MicroSD card. 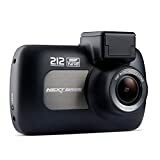 Utilizing the 2.19MP Sony Exmor CMOS sensor, this dash cam provides excellent image quality in a sleek package. Its small construction doesn’t allow for a screen, instead incorporating onboard Wi-Fi to sync up with your smartphone. There are also a limited number of buttons on this model for the same reason. Using your phone as a remote, you can change any settings via your phone while receiving and recording crucial moments with the touch of your finger. Night vision capabilities are included, which also record in the camera’s crystal clear 1080p. The GPS allows for critical data tracking, while a time-lapse feature allows the camera to keep recording while your vehicle is parked. This camera also includes speed and traffic warning via a red light, alerting you before a collision happens or if you’re well over the speed limit. This model offers a 140-degree viewing angle, an internal memory, and a microSD card. The first, and perhaps neatest, feature that stands out on the Nextbase Duo is its front and rear-facing cameras. Instead of running wires to a separate screen, Nextbase kept the design for this dash cam as simple as possible without sacrificing quality. Each camera also features a 140-degree viewing angle. A Wide Dynamic Range image processor allows for low light and night time recordings, the two-inch display and menus are user-friendly, and the loop recording function automatically deletes older files to save space on the microSD card. There’s also a built-in GPS module for accurate data tracking. This camera records in 720p, which is the compromise for its dual functionality. Its screen displays a split image of the front and rear view, however. There aren’t any Wi-Fi or Bluetooth capabilities either, which means you’ll have to extract the SD card manually. Those minor caveats aside, this is an excellent choice for a dash cam. 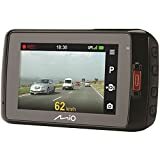 While this model has been on the market for a while, it remains one of the best dash cams on the market. The Mio MiVue offers sharp images in 1080p full HD, a 105-degree viewing angle, and the GPS tracking you need for critical data. Built-in Wi-Fi makes transferring your videos and images a breeze, eliminating the need to remove the microSD card. High-performing sensors ensure you never miss a crucial moment, while the screen’s blackout feature eliminates distractions as you drive. One of our favorite features on this model is the speed trap warning. Your camera will alert you when the speed limit is about to change, saving you the potential hassle of a ticket and a few points on your license. Garmin is a giant in the industry, and their ability to make quality electronics shines through in the 35 model. GPS positioning technology, 1080p full HD quality, and a G-sensor are all included in this dash cam. However, the neatest feature might be Garmin’s Dash Cam Player software. This software, which is available for free, allows you to transfer videos and images for review while organizing all of your files. The digital map works with the GPS to show you exactly where incidents occurred, too. It’s very user-friendly software. Finally, the 35 includes a speed trap warning. Once detected, the dash cam will make a loud beep to grab your attention. On the downside, the field of view is only 118-degrees. The Number 1 Insurance Dashcam brand in the UK. 1920x1080 FHD resolution with Advanced Low Light Performance. The RoadHawk offers a simple solution to your dash cam needs with no-fuss features and quality image capturing. A gyro-balanced image stabilizer pairs with sensors to ensure your footage is crisp, clean, and clear. GPS takes care of the details, while a built-in microphone captures sharp sounds. You can add to this model, too. The audio jack allows for additional microphones, and there’s room for an external GPS antenna if you need to give your signal a boost. What this model lacks in looks, it makes up for in ability. Compact and intuitive, the CDR 840 utilizes a small touchscreen with a joypad switch interface on its sleek body. These allow you to capture critical moments with ease, though the G-sensor can do that for you in the event of an accident. The camera itself shoots in 1080p full HD, has a built-in GPS, and an exceptional mount. Where Cobra’s dash cam begins to struggle is its ability to record in low-light scenarios. The GPS is also known to drop signal in adverse weather. While those two downsides might be deal breakers to some, the easy setup and no-fuss functionality might be what others are looking for. TaoTronics’ TT-CD06 model doesn’t include as many features as its competitors, but it also falls into the budget dash cam category. There is no GPS, Wi-Fi, or Bluetooth, but that doesn’t mean this camera can’t deliver. A G-sensor allows the TT-CD06 to automatically save footage from any incident, the 160-degree viewing angle is enormous (capable of capturing five lanes of traffic), and the low-light recording capability is excellent. This model also records in 2k and 1080p full HD. There are indeed better models on this list, but the TT-CD06 makes for an excellent entry-level dash cam if you’re pinched for cash. The Z-Edge offers incredible image quality at Ultra 2k and 1080p full HD resolution. The 145-degree viewing angle ensures you capture anything you need to, the interface is user-friendly, and its built-in capabilities are fantastic. A CMOS sensor pairs with advanced image processing for quality footage and the ability to capture small details. The 3-inch touchscreen is larger than most, but automated functions mean you won’t have to mess with this dash cam. While all of these features are fantastic, the Z-Edge is unable to record when your vehicle is parked. There’s no GPS tracker, which means you won’t have vital information for a court hearing or your insurance company in the event of an accident. You won’t find a rear camera on this model, either. Even with those downsides, this is an excellent option for a no-fuss dash cam. We love the image quality and think this model might be best suited for catching unique moments while driving. YI’s model is incredibly compact but manages a 165-degree field of view. It shoots in 1080p full HD and offers built-in Wi-Fi for simple data transfers. There isn’t a GPS function, however. 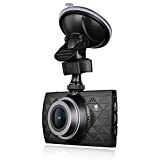 This smart dash cam incorporates an Advanced Driver Assistance System that utilizes a G-sensor to provide you with forwarding collision warning sounds and sense when you’re straying out of your lane. The same sensor also captures vital moments like it would on other models. 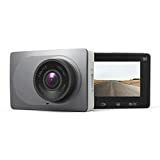 While YI’s camera lacks some of the features that many want in a dash cam, it boasts several others that make it unique without racking up an incredible price tag. Combine that with crisp video in regular and low-light situation, and this dash cam is an excellent choice. When picking out the best dash cams on the market for your vehicle, there are a few things that can help you find a model to suit your needs. This handy buyer’s guide highlights some of the main aspects to consider before making a purchase. No matter what you plan to use your camera for, there is a list of the basics that any camera worth its cost should cover. First, a larger field of view is always better. Anything under 100-degrees isn’t going to capture objects on the side of the road. Frame rate us equally as important. This determines how well the camera can record while you’re in motion, with higher rates reducing blur. Usually, 30fps is enough to capture quality video. Next, consider what additional features you might want. Would you be happier with Wi-Fi? 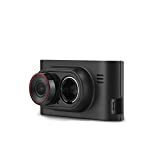 Do you need the dash cam to record at night, while your vehicle is parked, or connect to your smart devices? If you want to use your camera as a way to record potential accidents, then emergency recording is essential. Sensors that detect specific motion (G-sensors) will tell the dash cam to record, capturing vital moments that you may need for your insurance company or in court. GPS tracking is also a must for this purpose. It records how fast you were going, whether there was a sudden stop, and exactly where your vehicle was in the event of an accident. You might also want to consider a model that continues recording when your car is parked. If you plan on using your camera fun, then aim for something with excellent image quality. Sacrificing features like GPS for 2k resolution makes perfect sense in this instance. The goal is merely to capture the moment in crystal clear definition.